Nanaimo's Highest rated accommodations! Canada Select 4 1/2 stars. 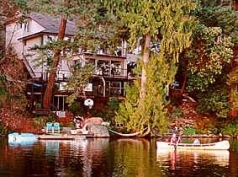 Waterfront Lakeside Lifestyle: sailboat, canoe, paddleboat and rowboat complimentary. King and Queen Suites. Kitchenettes, Gas fireplaces, TV, VCR, Jacuzzi tubs, Outdoor Hot tub, Cooking fire pit on beach. Private beach and wharf. Full breakfasts included. Great swimming and fishing.